Money is tight for many people and wedding costs can easily get out of hand. There are many ways to keep the costs down and still have a nice wedding. This is a guide about planning a frugal wedding. When planning a wedding, there are ways you can be frugal. One of them is to make your invitations instead of getting them made. Buy pretty printer paper, type them up, and decorate them with your personality. People never notice the difference and it's so much cheaper. Another thing you can do is have family members help with setting up. Your nieces and nephews think they are playing when making paper mache flowers and folding napkins. Although these ideas may seems a little too cheap, no one notices that there is anything different and studies have shown that people like when the bride and groom use their own creativity in a wedding! Another group of friends, a classical quintet, provided the wedding music. The reception music was simply a CD player or something of the sort, I think. They designed their own invitations, and I believe they got a deal from the printer who duplicated them. The party favors were the unique thing I remember best. My daughter and son-in-law found origami patterns online and printed enough of them to allow each of the 150 or so guests to take home their own creation. They cut off the excess paper, rolled each printed page into a small scroll and tied it with a thin ribbon. Last but not least, the wedding and reception were in my son-in-law's parents' back yard, so there were no rental costs for the venue. My oldest son took the super-frugal route this past August: they almost eloped, lol! The wedding was at the county courthouse, with a post-wedding lunch at a local Mexican restaurant. Everyone paid their own way. My youngest son's wedding was also in his in-laws' backyard, too, but the reception was in a local party room that used to be a roller skating rink. Subway sandwiches and fruit punch were served. Too bad he forgot his sister's pineapple allergy; she had to request bottled water. Sigh, "pobody's nerfect," I guess. Anyway, I hope this gives you some ideas! My husband and I were single until we were thirty, so we agreed that a "full blown" wedding was not what we wanted. Instead we opted to save our money for a honeymoon trip to England, and to put together a more economical wedding. We planned a small invitation list, about 50, that included a few friends and relatives. Were we ever surprised when many of our friends and co-workers "invited" themselves to our wedding with comments like "We thought you two would NEVER get married", and "This we gotta see! When's the date?" The guest list grew to almost 200! Well, we couldn't afford hurt feelings OR a big wedding so this is how we solved it. We made a list of all the components : location, food, flowers, music, decorations, invitations, cake, dress, beverages, etc. Then one by one we decided what we could scale back. As we were doing this my best friend, (who was going through a nasty divorce at the time) called in tears and said she could not afford to give me a gift or even attend the wedding. Of course I was crushed, by her absence, NOT the gift! LOL. A solution came to me and it also provided the solution to our ever-expanding guest list. My friend is an excellent seamstress and the dress I had purchased from a vintage shop needed repair. I suggested that as her gift she fit it for me and I would pay her a token sum as well so she could attend. She was thrilled, and so was I! Next I approached other friends and made like suggestions. In place of the usual gifts or money, would they be interested in pooling together for the wine? The cake? The flowers? The response was tremendous! 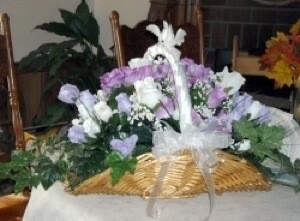 One friend, a florist, supplied the flowers at wholesale and donated her talents as designer. Another did my hair. Several others bought the cake and champagne. We had opted for a champagne and dessert reception to keep food costs down and had chosen 8 p.m. for our June date. Another close friend, who lived on a lake,very generously donated her garden for the ceremony and reception and relatives rented the tent. We got the chairs from the local Fire Auxiliary at 50 cents each, with the understanding that we would pick them up and return them ourselves. My colors were pale yellow and white, so we covered the tables with snow white sheets that we pinned under and put wide yellow florists ribbons criss-crossing and cascading down to the grass. In the middle of the tables, to hold the ribbons and the bottles of champange, we put small Styrofoam coolers, covered in pale yellow satin and filled with ice cubes. These were surrounded by wine glasses from the dollar store. Flowers finished the festive wine tables. The dessert table was buffet style, the goodies made by a young woman starting her own catering business. She gave us a great price because we let her put cards on the tables. Our photos were taken by my new brother-in-law, mostly candid shots, which really were so much fun to look at later. No video! The music was a student string quartet that played waltzes and hymns throughout the evening and our wedding song, The Sleeping Beauty Waltz, whenever my new husband gave me a kiss. There were no disappointed guests, no "rubber" chicken dinner and no tacky jokes. There was a very happy party, a delicious reception and a fabulous honeymoon in England. One of the guests had taken her own photos and sent them to a local paper with the story about our wedding. The paper ran it on a full page! Today, 30 years later, many of our former guests still say it was the best wedding they ever attended. (Me too!) Oh, and by the way, my total cost for my dress, husband's new suit and 200 guests was 2500.00! In 2008, a series of events were brought to our family. Our oldest daughter decided she wanted to get married in October (the month and day they met). So, that was one wedding. Then, the next wedding was for my step-daughter in May. Our daughter is getting married in June of '05 and we need to be careful about the amount we spend on the wedding. When my husband and I got married, we only spent $300 out of our pockets for the entire wedding. That included the flowers, my dress, invitations and programs. You can have a great wedding for a lower price as well. You can have a large beautiful wedding if you limit your shopping to thrift stores, Walmart, and Dollar Tree. This wedding cost under $600. I got married in October so I used the flowers in season. This was very cost effective. I also did a small round two layer cake to cut, and did a sheet cake in the kitchen to serve to the guests. When planning your wedding, ask the groom's family to be in charge of, and pay for any alcohol beverages served. If you aren't serving alcohol, the groom's parents can pay for another part of the reception. We have a small budget for our wedding and catering is so expensive. If we do it ourselves with frozen lasagna, salad and bread will it look cheap? How can we have a nice meal on a tight budget? I echo redhatterb, you can do what you'd like (and can afford!). True friends and loved ones will be there to help celebrate your union. The rest is just gravy! My reception was buffet style. We had croissants purchased from Sam's (sliced the night before) with meat and cheese trays so guests could make their own sandwiches. We made barbequed meatballs, little mini-quiches (also purchased from Sam's), and some of my mom's Japanese friends offered to make a few dishes. It worked out just fine. But I think I had maybe 2 or 3 bites of food. You should have your maid of honor get you a plate, and please sit down and eat some food. It's a big day, and you don't want to pass out! It's possible some close friends or relatives would be happy to help you out. Look into some finger foods and don't worry about serving a big formal meal. I hope you have a wonderful wedding (and marriage). Enjoy it! It will not look cheap. It will look like you are a financially responsible couple with a great deal of common sense and down-home hospitality. 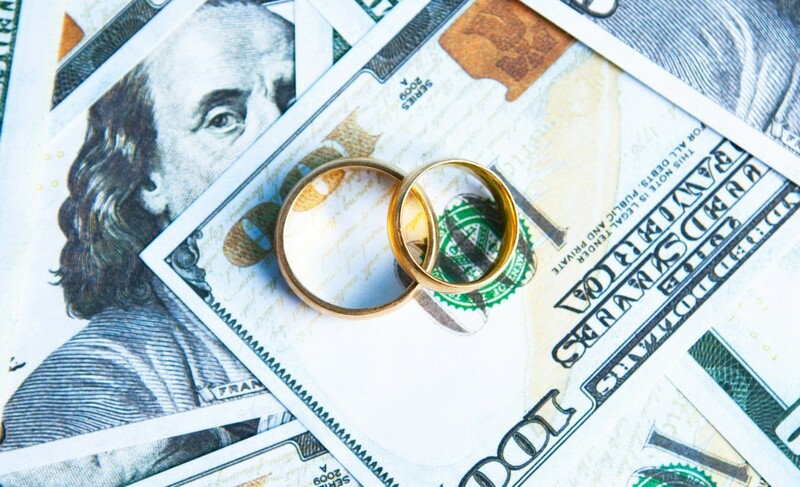 Too many couples spend lavishly on the wedding day, robbing funds from the marriage, itself. By keeping to a budget within your means, it will be a wise and rich investment for your future. If anyone fails to notice just that, it's their problem, not yours. *You can save money by asking friends to help (cook, serve, clean-up) as a gift. *Serve as a quasi buffet line (people walking through) but have your server friends on the other side of the table to actually serve and control portions. *The disposable, hard plastic dinnerware looks better than paper plates, but won't cost as much as rented china. Some of it is actually dishwasher (top rack) approved and could be reused in your home after the wedding day. *If you offer a variety of side salads (a green salad, a meatless antipasto salad, a jello salad, veggie casserole, whatever,) and a few differently seasoned kinds of bread sticks, guests that either don't eat meat or don't like lasagna can still fill up. Sarah, it's your day. I say do what works best for you. My oldest son got married at the courthouse, with just a handfull of us attending. Then we all gathered at a local Mexican restaurant and paid for our own meals. That in no way detracted from our joy in the union! What we did was, prepare a menu together, cook for 3 days together and we enlisted parents for the cake and we provided beer on tap, coffee and tea, also a lovely punch and kept our expenses low. Our reception was in our rented home and we fed 50. It was fabulous and we knew that our love would last. It has for 30 years. We still cook together too. In addition to what has already been said, have you considered an afternoon wedding? You can just serve cake cookies, nuts, mints, and drinks. If you like, you can add fruit and finger sandwiches, or maybe a chocolate fountain. Good luck. I'm interested in any suggestions on how to contain the cost of a wedding. For example, I need help with dresses, flowers, food, venues, etc. If you need ideas for a frugal wedding, just plain go and get married. It is the thought between the two of you that counts, not a showy affair. Have a couple friends or relatives stand up with you and go out for a meal after the ceremony. Otherwise have the ceremony in somebody's house with just immediate family attending. Have it during a time of day that you won't be expected to serve a meal and just have a small wedding cake with coffee, tea, and punch. Have a couple relatives do the serving. As far as dresses, flowers, etc. you know better than anyone what you like. When I got married we got married in the pastor's study, and I wore a white brocade street length dress that I had made with a white hat and shoes and a red carnation corsage. My sister wore a red dress that was a hand me down from me a couple years before and a white hat and shoes. That was it. The men wore dark suits and had boutonnieres. Back then if I had bought my dress it probably would have cost at least $100.00, ready made. I can't remember what the fabric cost but it was pricey for the early 60s. However, even now you can find really nice looking street length dresses or even really dressy suits that can be worn for other occasions. Just look up "wedding" here & you will find lots of frugal ideas. It can be done, I have done 2 weddings for very little (Under $1,000). My first wedding was ultra-frugal. My wedding dress came from a consignment shop, as did the groom's suit. The only people in attendance were the pastor, the best man, matron of honor, and the groom and me. I typed announcements after the fact. We bought some semi-fancy plain cards that I typed on a borrowed typewriter (this was in 1982.) His family gave us a pot-luck reception at their church's fellowship hall a couple of days later. My current hubby and lifemate and I also had a very small wedding, although my dress was new and from Sears or Penney's. Again it was the attendants, the pastor and us. We went to a local Chinese buffet afterwards. Our oldest son got married at the county courthouse, with a handful of folks other than hubby and me, and we went to a local Mexican restaurant afterward. I'm not sure where my daughter-in-law and her maid of honor got their outfits, but the rest of us just wore nice church clothes. These three weddings are the most frugal I can think of. Best to you and your new spouse! We want a super small wedding! Either just the two of us, or very few people. We live in Washington state and need some help with ideas. We don't know if we should travel somewhere to get married or just do it around home? Help! I would like some ideas for planning a wedding with the theme, soul food. Please provide thrifty ideas. Thank you. My nephew got married in May of this year. He and his bride to be didn't have a lot of money, so she wanted to get married at her moms house, and they asked each guest to bring a covered dish. We live down south, so he asked his relatives to bring their soul food, like they have around the Holidays. They did, and it was just wonderful! Also, my hubby & I just did finger foods at our wedding that pulled it off nicely and it was a small get together because we didn't want a huge expensive wedding. I really liked my nephew & niece's (yeap she's family now!) Idea of covered dish! Wish I'd thought of that! Hope this helps! Weddings take a lot of planning and tend to come with a big price tag for the new couple. Discuss what you and your future spouse consider to be essential to a "perfect" wedding and start from there. 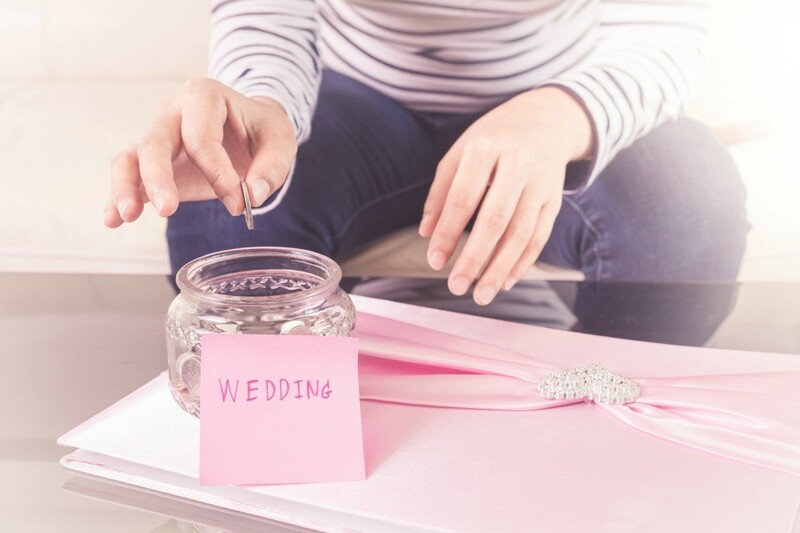 This guide contains advice for planning a wedding on a budget. Frugal ideas pertaining to any and all aspects of the wedding, from the ceremony to the reception and everything in between. These are tips from the ThriftyFun community. We are getting married on February 20th, 2010. I have almost no budget. Our colors are burgundy, champagne, and ivory. We will be doing all of the decorations, food, etc. ourselves. Please help. I'm planning a wedding around Howard County, MD and would like any advice you can give on an inexpensive wedding. I'm also struggling with finding an inexpensive alterations expert. Thanks for your help. 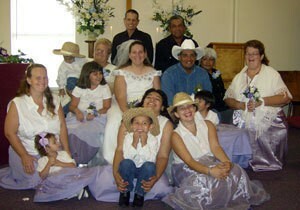 At my first daughter's wedding we had a committee from our church provide food. They were so willing and it was their contribution gift. We bought silk flowers from a wholesaler and had a local seamstress make the bridesmaids dresses. You can also rent dresses just like tuxedos (lot's cheaper than buying what they won't wear again anyway). I cut back on a lot of the expensive decorations. Instead of buying too much tulle, I gathered cattails, grass, sticks, etc. and painted them. I placed bunches of these in areas that needed coverage. I handmade my favors instead of buying them, which cut the cost down to 5 cents each. I also, made gift baskets for all my wedding party as opposed to traditional gifts. A lot of supplies can be picked up at yardsales and through trading sites.